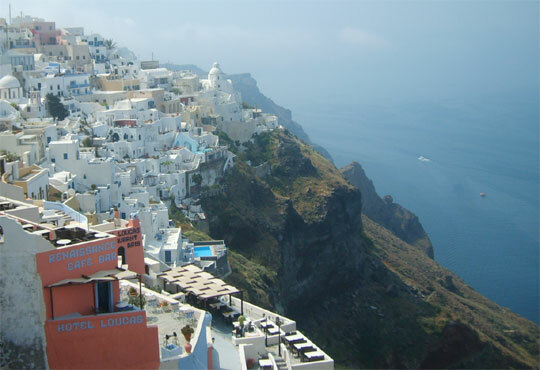 Fira (Thira) capital of Santorini is considered one of the most beautiful towns in Greece. The Greeks are actually very proud of it. The view from the edge of the cliff is breathtaking and there are many people who think it is one of the most beautiful views in the whole world. It is spectacular, I'd go that far. The town centre of Thira is at the edge of the cliff. All the exclusive restaurants, luxury hotels and pricy shops are located there. The price level is one of the highest in all Greece. Spending 50 Euro on a meal is no problem, 500 Euro per night for a room with a view nothing unusual and the exclusive jewellery shops are in a league of their own. You want to spend 5000 Euro for a ring? In Fira on Santorini that isn't a problem and they will gladly assist. A serpentine path leads the 200 meters down to the bottom of the cliff. It is meant for pedestrians. If you are feeling lazy you can also rent a donkey or use the cable car. The donkeys are very popular. 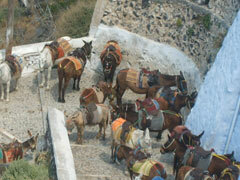 During high season about 100 donkeys are "on duty" to carry tourists up and down the path. Another interesting walk is along the path at the edge of the cliff. It leads to the suburbs up north. Thiras old town is a pedestrian zone. The lanes are narrow, beautiful and packed with tourists. 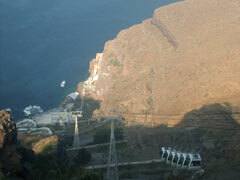 The further you go from the edge of the cliff the cheaper Fira gets. It takes less than 200 metres to leave the pedestrian zone. The main road is where you find the main square with its takeaways, small super markets, travel agencies internet cafes; right next to it is the bus station. 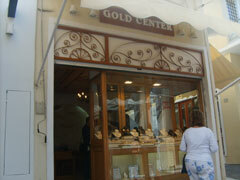 In the area you will also find more basic accommodation and shops for the - let's say - less wealthy tourists. 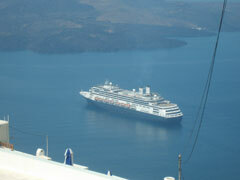 Fira is a "must see" if you are in the area and with that I mean the Cyclades. The city on the top of a volcano is something special. A day trip is enough though. 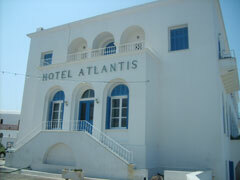 A good work around if you travel on budget is to stay in Perissa for example and go to Fira by bus. Busses from Thira: The bus station in Fira is the main bus terminal on the island. From here you get everywhere. The busses are frequent and cheap. The bus to the ferry port also leaves from here. Busses will depart approximately 90 minutes before the ferries departure-time enough. The bus station is situated in the centre of the city, conveniently located close to all major attractions. An up-to-date bus schedule you will find at the station.